Here in Chamonix, the fall mornings are suddenly becoming much more brisk. Puffy winter shells have made their annual reappearance. Snow comes and goes from the high pastures. Trail des Aiguilles Rouges, organized by the local CMBM trail running club, was run last week. The race, a favorite among locals, bookmarks the end of another season of trail running. Our first tour of the UTMB route takes a time-out at the Bonatti Refuge, in Italy’s Val Ferret. It’s been a remarkable season for Run the Alps—our biggest by far, with dozens of clients participating in village-based trips, running around the Mont Blanc massif, through the Berner Oberland, and in the Valais Alps on Switzerland’s border with Italy and France. Clients took part in trail races ranging from the Eiger Ultra to Sierre-Zinal to Trail des Dents-du-Midi. Through it all, I saw a lot of sweat, smiles, and laughs. If you joined us here this season, I hope it was the highlight of your year! Annabelle Wheeler wraps up the Eiger Ultra 51-km race in style, with Run the Alps guide Abby Strauss-Malcolm bringing her in for the last kilometer! Already, we’ve taken a number of reservations for our 2016 trips. What’s in store for next year? Entirely new route descriptions with detailed maps, bail-out options, run profiles, and much more. A special Chamonix, France and Courmayeur, Italy trip based around the adrenaline-filled excitement of Skyrunning races and the venerable Chamonix Mont Blanc Marathon. Our trips along the UTMB will feature new route options, plus the chance to have a relaxing soak in Italy’s Pré-Saint-Didier hot springs. And after the run… the food. Hanging out in Champex, Switzerland, after a long run on the course of the UTMB. If you or a friend is involved professionally in the trail running world, please keep in mind that we offer Run the Alps postcards for events. 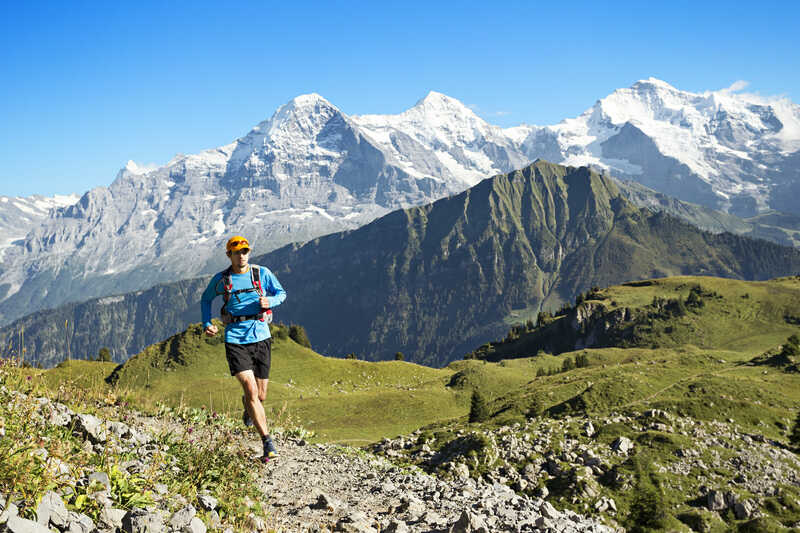 Run the Alps will contribute 5% of the cost of a trail running tour to any race or trail running event that shares our card, if someone signs up for a tour from seeing the Run the Alps card. Spell it out for us! S-W-I-T-Z… on the border between Italy and Switzerland. This summer, on the trips he guided, Run the Alps’ Alister Bignell started each morning with a favorite mountain quote. In that same spirit, until we cross paths again, I hope you’ll keep in mind the words of Douglas Fraser, from his poem, Freedom of the Hills. On behalf of Troy, Abby, Claire, Alister, Alex and all the rest of us at Run the Alps and our ever-capable partners and friends at Alpinehikers, we wish you happy trail running.